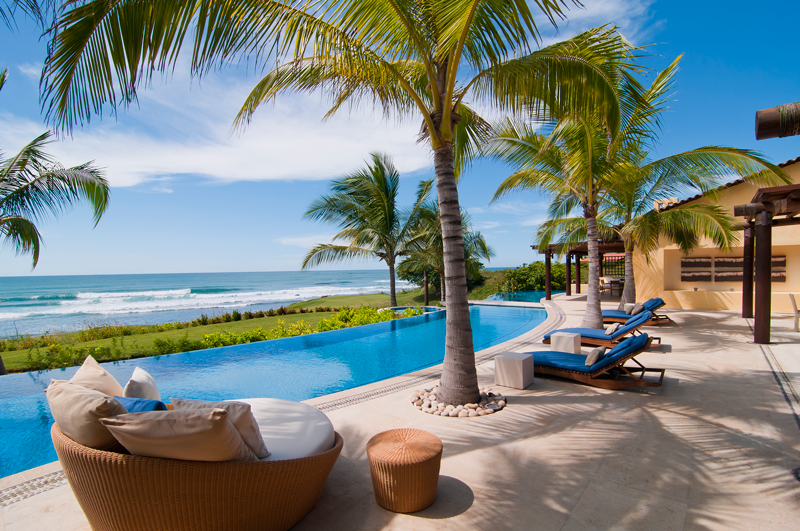 Located within the gates of Punta Mita, Mexico’s premier oceanfront golf community, Casa de Olas is a prime example of the casual barefoot-luxury lifestyle. Punta Mita’s reputation as a privileged location on the northern edge of Banderas Bay is well known among those seeking the ultimate oceanfront experience in Mexico, its natural appeal greatly enhanced by its location on a peninsula bordered by the Pacific Ocean on all three sides. Many of the spectacular residences located within the gated community have been featured in prestigious publications such as Architectural Digest, making them favorite getaways for international celebrities looking for the perfect private getaway. 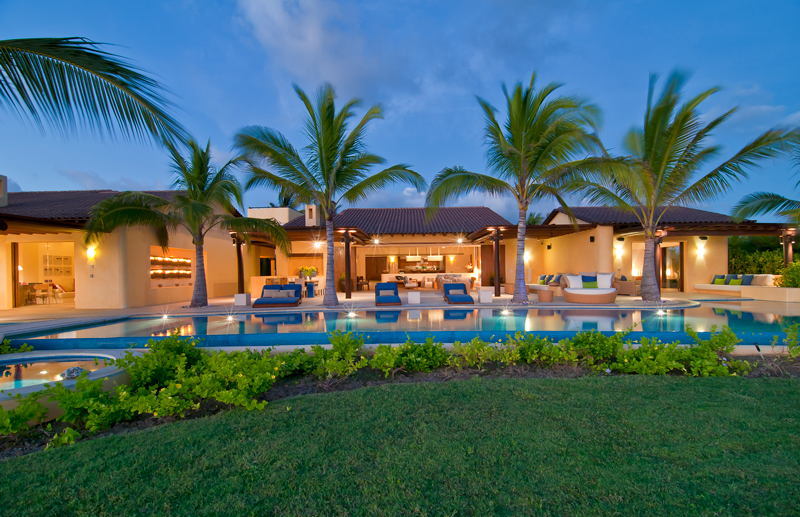 Casa de Olas is one of just eight residences in La Punta del Faro, an enclave within the La Punta Estates subdivision of Punta Mita. It was designed by one of Mexico’s foremost architects, Diego Villaseñor, also responsible for the design of the Four Seasons Punta Mita and several of the Four Seasons Private Villas Punta Mita. His approach to architecture seamlessly blends nature with contemporary Pacific Coast architecture, where simplicity and warm colors complement modern conveniences. His well earned reputation for seaside composition has led to the design of projects throughout Mexico, Latin America, the United States, the Caribbean and the Persian Gulf. The residence was built five years ago, primarily on one level, and features five bedrooms, five full bathrooms with indoor-outdoor showers — a trademark of Pacific Coast architecture — and two half bathrooms, plus a second-story office and an ample media room. Its location on the northernmost tip of Punta Mita faces west, offering spectacular views of the Marietas Islands and incredible sunsets year round. Featuring several structures connected by winding pathways surrounded by lush vegetation, it gives visitors a sense of anticipation as they enter the property. Once inside, not only are the Marietas revealed but also the oceanfront 17th hole of “Bahia,” one of Punta Mita’s two Jack Nicklaus Signature golf courses. The northern side of the residence offers two identical master suites with beach and ocean view featuring chiseled marble floors. A third suite faces the gardens. All three are completely secluded, allowing guests absolute privacy if needed. Casa de Olas’ pièce de résistance is its spectacular living room area, which provides direct access to a swimming pool large enough for lap swimming if desired. The adjoining dining room features a grand table substantial enough to accommodate 14. Behind the dining room, a spacious open kitchen allows at-the-counter seating and features top-of-the-line appliances, including two double Sub-Zero refrigerators, one located within the generous walk-in pantry by the wine cellar. The living/dining area features high ceilings with a unique cross-beam design that borders on sculptural. Nearby, the master bedroom faces the ocean and offers direct access to an outdoor sitting area and the pool. Next to it, an outdoor bar and lounge area that connects with the expansive indoor living area is ideal for intimate gatherings and fantastic sunsets. An ample media room allows guests to immerse themselves in a comfortable, state-of-the-art home theater experience. Next to it, another large bedroom faces Casa de Olas’ carefully tended gardens. All rooms feature solid wood shutters, providing complete seclusion from the surrounding environment. Casa de Olas also features a complete indoor gym with top-of-the-line training equipment. Next to it, a small private terrace with artificial grass is the ideal space for outdoor cardiovascular training and even a few casual golf putts. A staircase leads to the only second-level feature of the residence: a spacious office facing west, an ideal hideaway that allows for inspired productivity. Directly above the office, an upper terrace offers a 360-degree view of the Punta Mita surroundings and is ideal for yoga or meditative relaxation. In addition, this vantage point also offers sunrise views, a unique feature exclusive to only a few privileged locations within Punta Mita. Whether you choose to curl up on a plush sofa with a good read, relax by the pool or enjoy the natural surroundings, Casa de Olas is a perfect luxurious retreat for families. More information about the property can be obtained by contacting Riviera Partners Realty (rivierapartnersrealty.com).